Hanbury gets lead billing this year. Local artist and writer Robin Shaw explores the history and ecology of Hanbury Woods, plus there’s a review of A History of Hanbury by local historian Andrew Harris – and a painting of Pipers Hill by Norman Neasom on the cover. Two articles focus on the lives of local women with remarkable stories Mary Johnson was an 18th-century heiress who suffered terribly at the hands of her gold-digging husband, William Chance. The life story of Jean Davidson is also profiled. Best known as a former Chair of the Bromsgrove Magistrates and for her charity work, Jean has a fascinating backstory, including working for the intelligence services during the Second World War. Other contributions include a history of the Park Gate Inn, off Kidderminster Road; photographs of the town in the 1960s by Bromsgrove-born documentary photographer Nick Hedges; and extracts from a talk by poet Sir Geoffrey Hill, one of Bromsgrove’s most famous sons. 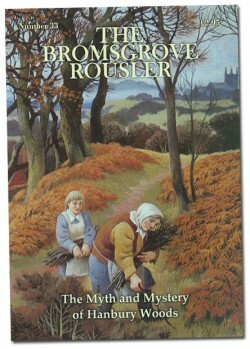 The Bromsgrove Rousler is available, still at £2.95, from a wide range of outlets including: WH Smith, Foto Factory and Coffee Two in Bromsgrove High Street; Banner Foods in Aston Fields; It’s A Gift in Barnt Green; Blackwell Stores; and most local garden centres. This and past editions may also be purchased as a download at http://www.bsoc.co.uk. An index to all editions of the Rousler back to 1986 is available as a free download.